We all have that one pair of jeans we love and hope to find once again when their time is up. However, we also have those jeans that we might have used once because we wanted to try out a new trend, decided it wasn’t for us, and possibly forgot even existed in our closet. If you can relate, then your denim section might need some cleaning up. Lucky for all of us, 2018 is almost over, so it only makes sense to start the New Year with denim trends that you’ll actually want to wear more than once. You know the saying: new year, new jeans (or close enough). 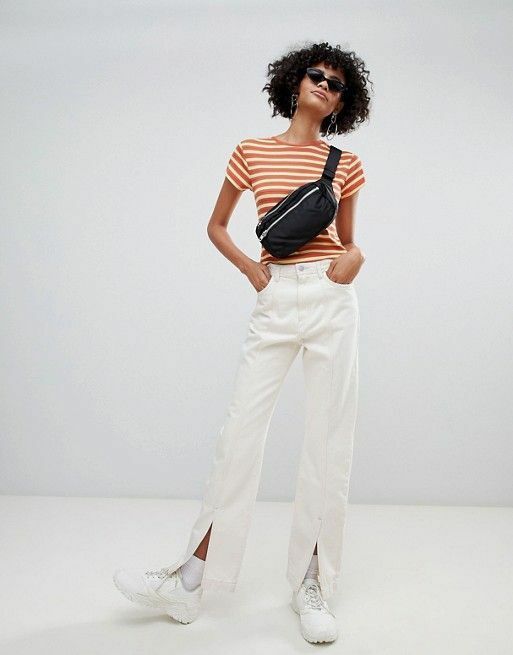 Sure, your vintage high-waisted denim jeans aren’t going anywhere anytime soon, but there are three outdated denim trends that should go, and we’re here to tell you what they are. So, make sure you spot your nearest thrift shop or donation center stat because the trends on our radar are really cool, and we know you’ll want to give them a go. From opening your arms (and closets) to denim that goes beyond blue to welcoming embroidery and ditching that fraying habit on the jeans you thrift, see the trends we’re leaving in 2018 and the ones we’re welcoming in 2019 ahead. Here for this subtle slit. Such a cute hem tie. The tie on the bottom of these jeans can convert the hem instantly. These are easier to style than you'd think. If colored jeans are still too bold for you, keep it in the neutral family. A new type of floral. Give your black jeans a cute twist. Brb, buying these right now. More of a trouser person? You'll love these pant trends then.